Many companies offer supplemental services or products that complement or enhance Open Dental. The vendors listed below offer supplemental services and products to Open Dental customers. We do not necessarily endorse any of these companies, nor do we provide technical support for their products or services. We encourage users to let us know about positive and negative experiences. Note: Open Dental does not share your information for marketing purposes. Other companies provide services and products that work with Open Dental to do more for you, like sending electronic insurance claims and handling patient imaging. These internal links take you to more detailed pages that will help you integrate with third party systems. Practice IQ. Run your practice like a true CEO. Translate data and metrics into easy-to-understand numbers that you and your office manager can use to drastically increase productivity and revenue generation. The only system in the world that is real time and moves at the rate of your practice. Practice Intelligence by Dental Intel. Integrates	your practice management and accounting system data. BlueIQ.Track what matters most, know the minute you need to take action. With a single, intuitive dashboard containing all your business data from your Practice Management System, Facebook, Google Analytics, Quickbooks, and more, you can make brilliant decisions in seconds; from custom, automated reports that align your goals with real-time performance, to customized alerts that notify you when your business needs your attention. BlueIQ is a dental dashboard that goes beyond traditional business intelligence to create a data-driven culture where each team member is engaged and values their contribution. ClariCare provides tools and insights tailored for your practice. We connect directly with office Practice Management Systems to provide modern analytics, practice management enhancement, and other tools to run your practice efficiently and effectively. Our suite of solutions unlocks the power of your existing patient database to painlessly grow your practice. Divergent Dental Resources. Automated dashboards, KPIs, and reports for you to analyze and grow your dental practice. Practice Catalyst by Elevate Practices. Practice Catalyst combines a comprehensive, web-based dashboard (Open Dental plus Accounting) with tools and systems for making decisions and assuring effective execution. Practice Analytics. Practice Analytics is a real-time dental practice management tool designed to help monitor and diagnose the business health of your dental practice. Practice Analytics simplifies the ability to manage what’s happening in a dental practice by identifying and monitoring key business drivers. Using the treasure trove of information found inside Open Dental, doctors, managers and staff can continuously recognize areas of opportunity within the clinic and its patients. DentalTek. Hosts Open Dental on the cloud providing anywhere access for doctors and staff. Manage single/multi-location clinics in a single, merged database. Offering highest possible security and HIPAA compliance with real time, multi-location backup and 24/7 threat monitoring/data protection. Whole Technology provides Technology as a Service to the modern dental practice. Contact Whole Technology to have your OpenDental software hosted in a geo-redundant, reliable, and fully HIPAA compliant environment. You’ll never have to worry about the security of your patient data and your practice management software will be accessible and available any time, anywhere. Carebridge Digital is a marketing agency specializing in creating solutions for companies to create their internal technology structure, brand their business, and develop their marketing strategy to reach their target audience. Services provided include Marketing Strategy, Online advertising, Web Design, SEO, Social Media, Video Production, Photography, Reputation Management, IT Solutions, and IT Network Designs. CXC Dental provides dental practices with creative marketing services which include custom web design, SEO, social media management, practice branding, patient education videos, full service printing, video and audio production, full service laboratory, and patient financing. Podium OD. Automates the process of generating patient reviews on Google, Yelp, Facebook, etc. Make it as painless for your patients as possible. eEndorsements is an easy way to capture more patient reviews on Google, Facebook, Vitals, Healthgrades and more. Automate the process and take control of your online reputation. Auto Front Office. Automatically sends review requests to patients via email and text message. Modento is an innovative and robust solution for patients engagement, communication, and loyalty. Streamline your processes to boost efficiency and let your team engage with your patients to keep them satisfied and connected. Maximize your social media presence using a powerful, AI-driven tool that will help you generate reviews in a tactful manner. Reminder Dental. No two offices are the same, which is why ReminderDental offers 3 different methods of soliciting review requests from your patients. ReminderDental also offers a free service that helps migrate past reviews from other review sites and posting them to Google's, Facebook's, or Yelp's service. Requests can be a simple email, or a survey that allows your office to filter negative reviews. These features are included in our Appointment Reminder service(see below). Services include online appointment scheduling, reminders, postcards, text messaging, email, recall, confirmations, etc. DentalTek. VOIP phones fully integrated into Open Dental. Smart Office Phone technology provides key information about your patients when they call in, including future appointments, balances, unscheduled appointments, missed appointments, etc. System integrates reminders and paperless forms so more patients arrive at your office with forms already completed. Angela@Opendental. Dental office virtual receptionist capable of speaking natural language and taking patient calls as a 24/7 standby receptionist. Dental office automation features include booking dental appointments, dispatching patients to emergency contact or voicemail, and appointment reminders. Patients can add, reschedule, and cancel appointments via text message. New patients can sign up and get appointments by text or online. AppointmentAid. Automated phone call, text message, and email appointment reminder service. Appointment Reminder allows you to send automated SMS, voice, and email reminders. Appointment Reminder is located in New Zealand and also offers service in the United States. CareCru is the creator of Donna™, a virtual dental practice assistant, powered by Artificial Intelligence, who grows and manages dental practices. Hiring Donna is like adding three world-class team members to your practice—a front office assistant, a marketing specialist, and a practice consultant. Donna needs no supervision. She manages a task from start to completion, with intelligence. By managing some of the more tedious, mundane tasks, Donna allows the front office team to focus their efforts on higher value activities. Donna is the front office’s new favorite team member because she rolls up her sleeves and gets right to work. We have been notified by many customers that Demand Force/Intuit has called them claiming to be Open Dental's partner and with "Open Dental" showing on Caller ID. Open Dental is not associated in any way with Demand Force/Intuit and does not share your information for marketing purposes. Dental ATM. Automated reminder texts, emails, and calls for unscheduled treatment, recall, and appointment confirmation. Birthday reminders and newsletters. Extensive document and video library for treatment education, patient retention and increased case acceptance. EasyMarkit offers powerful patient messaging that’s actually personal. Used by over 70% of dental schools in North America, EasyMarkit allows you to send customizable SMS, email and voice reminders automatically, keeping patients on track with their treatment and helping your office run smoothly. HourMine. Fully automated patient communication at a reasonable price. HourMine provides industry leading two-way SMS messages - reminders, confirmations, reactivation, reviews, birthdays, group messaging, RealVoice phone messages, email messages, patient portal and mobile booking. Interphase. Appointment reminders, two-way texting, voice reminders, total recall, birthday reminders, social reviews, intra-office communication, VOIP phone and service. Legwork PRM. Make the Legwork Patient Relationship Management (PRM) software the marketing hub of your practice. The PRM syncs with your practice management software and your Legwork Website to bring your unparalleled control and insight into every lead and patient relationship. Lighthouse 360. Autoconfirm, perfect recall, truetime data synchronization, mobile app, and patient reviews. Modento is an innovative and robust solution for patients engagement, communication, and loyalty. Streamline your processes to boost efficiency and let your team engage with your patients to keep them satisfied and connected. With Modento, communication has never been easier. Our algorithm will decide which communication method will be most effective and make sure your message is delivered the way your patients want it. Two-way text, email, and mobile communication will assure the maximum outreach. Multi Minder. Custom Cloud IRV and SMS Messaging solutions with a plugin for Open Dental that allows offices to send appointment reminders from their desktop. MyPatientScheduler. Two-way integration for online appointment scheduling, confirmation, and recall management. Patient Communicator. Patient engagement and appointment scheduling. Automated confirmations and reminders reduce no-shows saving time and money. On-line reviews and surveys to increase search engine ranking, online and social media presence. PatientDocs.com. Appointment reminders, online search engine marketing, and effective website design. Patient Studio. Online patient forms integrated with Open Dental – automatic appointment reminders – patient newsletter. Practice Mojo. Automated recall & marketing with exclusive ReachAll Dental Recall Technology, email, 2-way text messages, postcards, automated phone reminders, and more. ReminderDental is the most affordable solution for communication. With highly customizable options for Appointment Confirmations, Broken Appointment Notices, Recall and Reactivation, Birthday, ASAP, Attendance Tracking. Multilingual calls and messages supported as well as filtering messages with procedure codes to enable pre/post op communication. The communication schedule is fully customizable. See our info under Review Generation. RevenueWell. A comprehensive practice marketing platform: appointment reminders, recall, treatment plan follow-up, reputation management, social media management,and monthly newsletters. We're built just for dentists, and you'll clearly see the difference. Savance Health. Patient Sign-In and Tracking, Waiting Room Displays, RTLS, Asset Management and Tracking, On-Call Scheduling, Access Controls, and Time and Attendance. Solutionreach. Patient messaging via text and email, including appointment reminders, recall, newsletters, and birthday greetings. Voice2Phone. Appointment Reminder By Phone service. YAPI. Automated Patient Engagement. Appointment reminders/confirmations via text and email combined with automated recall due and past due reminders. Highlights: family reminders, Spanish, premedication, early arrival, custom nanosite, true two-way texting, appointment request and email blast. Includes Intra-Office Communication and Practice Dashboard. Summon providers and broadcast notifications to desktops and mobile devices. These companies specifically assist customers in the dental industry. For example, accountants, financial planners, office design, and so on. If a company provides IT services, they are on our Vendors - Computer Networking page. Dental WebSmart Insurance Solutions LLC. Dental WebSmart engages the provider, clearinghouse and payer in simplifying the setup of Dental Insurance electronic payment. Complete the enrollment process by learning how to move your practice into electronic based systems for the new era in dental technology. Todays Dental Consulting. Dental consulting exclusively for dental offices using or switching to Open Dental. These companies specifically assist customers in the dental industry. Innovative Advisory Solutions. With over 10 years of software management, implementations, conversions and mergers, we pride ourselves on observing the current technology, processes, individual and practice uniqueness to enhance performance and strategies for your exclusive practice. Our goal is to provide you and your staff the tools needed to have less work, more production and faster processes to grow your practice Together we’ll create and refine your plan for success. We didn’t get there alone. And neither will you. These companies provide resources to dental patients and work with dentists to create patient/dentist connections. Dental Care Genie combines powerful search tools, expert tips and reliable consumer information to help those looking for the best dentists that accept dental insurance and provide dental services and oral care education. Use their search feature to find family and pediatric dentists for dental procedures like tooth extraction, cosmetic dentistry, implants, veneers, braces, or teeth whitening. DentalTek is a leader in paperless forms, simplifying patient intake. Our service is customized so all of your Practice forms are available on iPads and transfer seamlessly into Open Dental. DentalTek is HIPAA compliant. Patient communication is available via email and text and includes a mobile patient registration option. The system integrates Reminders to Paperless Forms so more patients arrive at your office with forms already completed. Enlive Paperless Dentist. A iOS-based Kiosk app for iPad. Send paperwork to fill out, sign paperwork on the iOS touchscreen, etc. The app automatically detects Open Dental and connects to it, making the iPad an option in the Kiosk Manager. Available through the iTunes store. mConsent is an iPad software that helps dental practices go paperless, making the check-in process easy. We convert all your patient forms (new patient intake, medical history, dental history, and consent forms) into an iPad kiosk. Patients sign the iPad and documents transfer to Open Dental. mConsent is HIPAA compliant and includes other services such as Reputation Builder, Web Forms (patients submit forms online) and more. YAPI. See the True Paperless difference! Eliminate all printing, scanning, shredding and tedious data entry. All patient intake forms, consents and even treatment plans can be completed and signed anywhere in your office via an iPad. Auto-import patient data and signed documents to Open Dental. New patients receive a custom welcome email or text to complete mobile-friendly online patient registration before their first visit. Printing services for forms, brochures, marketing materials, etc. Select Impressions Print and communication services, from forms and full color brochures and marketing material to websites. Abyde. Never stress over HIPAA compliance again! Abyde, a revolutionary cloud-based solution, enables practices to attain and sustain HIPAA compliance with ease. Get audit protection, risk analyses, ongoing training, and more. Abyde handles HIPAA complexities so you can focus on patient care and building profitability. Central Data Storage: HIPAA compliant managed offsite backup recovery solution for dentists and Open Dental Software. Dental Claim Support: We are a dental billing company that handles insurance posting, insurance aging reports, sending claims, and full breakdown insurance verifications. DentalTek offers Open Dental users several innovative Cloud-based technologies all under one umbrella.Practices can use all of the DentalTek services or pick and choose: Cloud Hosting, Smart Office Phones with Practice Management Integration, Patient Reminders, Electronic Paperless Forms, and Marketing Tools. Phone IQ: Full phone integration with Open Dental without needing to switch to VOIP or a new telephone provider. Also includes deep phone performance analytics. Disk Agent - Remote Wipe: Protects Private Health Information (PHI) on a lost or stolen laptop computer. Avoid data breach and costly penalties with the remote wipe solution that cuts off access to your sensitive data before compromise. Satisfies HIPAA process and procedure requirements. Kaizen IT Group: We are the one stop solution provider for anything technology related in the dental practice. We specialize in IT & Audio Visual solutions, support and consulting for dental practices. Our services include: IT Support, IT Solutions, Audio/Visual – Speakers/TVs/Video, Network Security, VoIP Phone Solutions, Video Security, Office 365 / Google Apps, New Office Builds & Remodels, Outsourced IT, HIPAA Compliance, Web Design & Social Media, and Data Backup for Server and Workstations. 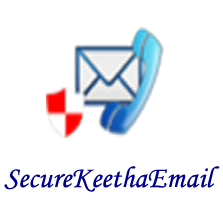 SecureKeethaEmail: Send and receive secure emails. You can keep your existing email address. The system works with Gmail, Hotmail, Yahoo, AOL, and many others. No passwords to exchange. No portals to log into. Voip Office: A leading provider of Cloud-based communications makes it affordable and easy to connect to anyone, anywhere in the world. Our communications solutions meet the needs of any type of business in any industry, from home offices to large enterprises. VoIP Office integrates easily with your business applications, seamlessly integrating your desktop and your office into one interconnected system. GreatDentalWebsites.com helps dental professionals create engaging custom websites that are focused on acquiring new patients. We've developed a unique website platform that easily integrates with Open Dental's eServices. As eServices best practices and product offerings change, our unique software automatically adapts for ongoing, worry-free, future-proof integration. Additional online marketing services like SEO and Pay-Per-Click marketing services also available. Aravis Designs. Specializing in dental websites. Provides web design, development, marketing, and SEO. BPKTech. Beautiful websites with unlimited content changes and improved Google ranking. Start at a low price with a low monthly fee. HRD Sq. The ConvergedComm plugin for OpenDental is a unified communication tool offering telephone system sync/integration, DigitalFax, automatic appointment confirmation, appointment reminder, appointment recall, birthday wishes to patients, and consolidated inbound and outbound communication log. Studiosight builds high visibility dental websites that get results and more patients through integrated marketing. Choose from unique design themes or simply give the creative direction for a worry free experience. Services include web design/development, marketing, SEO and site management. Procurement and ordering through: Elijah German. Laptop Computers, Desktop Computers, Tablets, Phones, Microsoft Office Suites, Windows-based hardware and software, Accessories, XBOX, Games.